When I imagined the work taking place in my house this week, I estimated it would take like five hours for a team of dudes to demo a couple walls, insulate, re-drywall, and texture. This is a thing I often do -- underestimate the amount of time a project is going to take -- because of sheer ignorance. Lessons learned: 1) Baseboard needs to be removed and re-installed as well. Easier said than done. 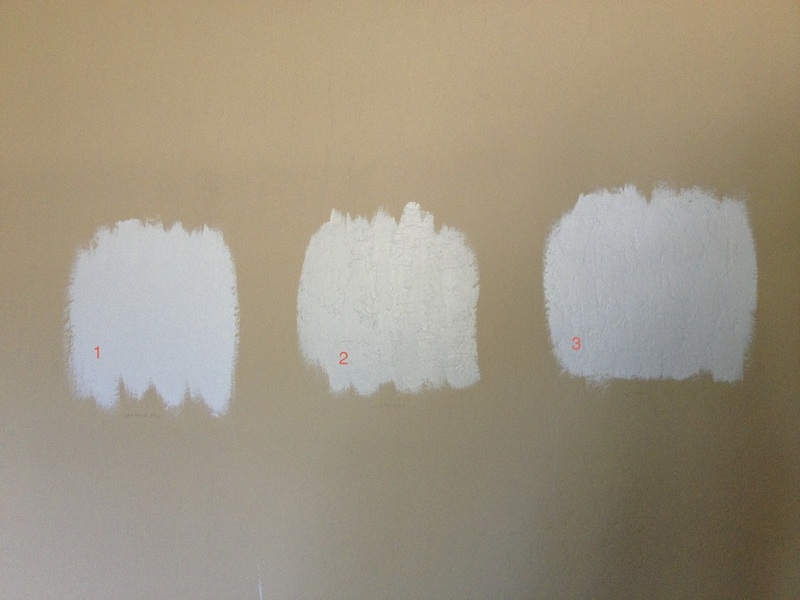 2) Sheetrock needs to be smeared all over the drywall cracks. Twice. Hahahahaha. You know, I thought drywall and sheetrock were the same thing, but sheetrock is, like, this gooey stuff they shove in the cracks so your walls don't look stupid when they paint them. Texturing, on the other hand, takes like 5 minutes. 3) Painting hasn't started but considering how the painter asked me three times if I wanted the baseboard painted while he stared at it forlornly, I'mma go ahead and guess painting is gonna be a bit more of a project than I anticipated as well. So after I mentioned how I thought my gray options looked blue, and a couple of commenters were like: Yeah that looks blue/green, I started doing some googling and realized this blue-looking gray problem is a common thing. So I did some Pinterest research and found a few grays that swear they don't look blue, and went out and got some samples of those. I put the new samples up in two different rooms and you can see how different they look in the different rooms. Partly due to lighting and partly due to the existing paint color. I noted the new colors with numbers so the 1s, 2s and 3s are the same colors, believe it or not. We are going with Number 1. Then while I was browsing the Sherwin Williams site I saw they have a Pottery Barn kids collection, so I went ahead and grabbed a sample of one of those colors, even though I'd already chosen the blue that I wanted for the baby's room. Crappy lighting but the new color is at the bottom. Also, all the samples are in a semi-gloss, unfortunately. They can't give you flat samples, for whatever reason. We're sticking with our original decision, which I will wait to tell you about until the nursery is done. Nice job! 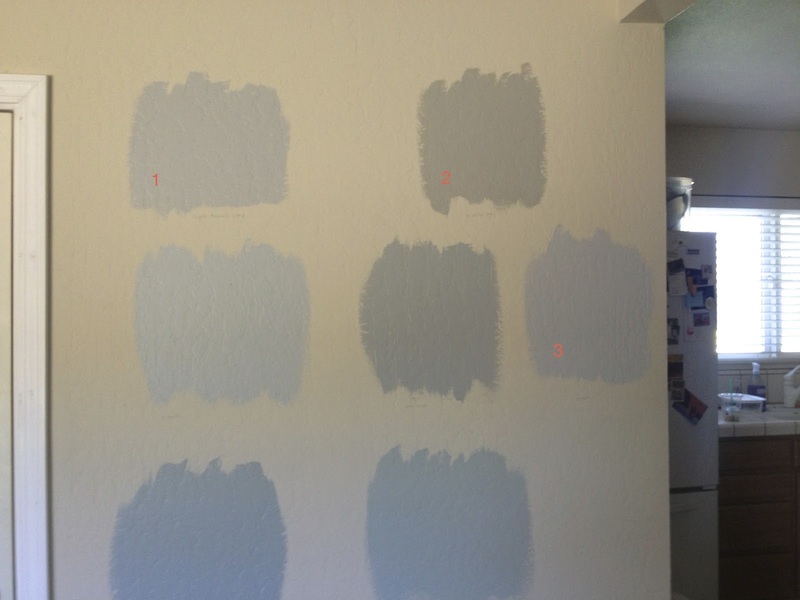 I'm very pro-multiple paint samples on the wall. They really do look different in different lights. 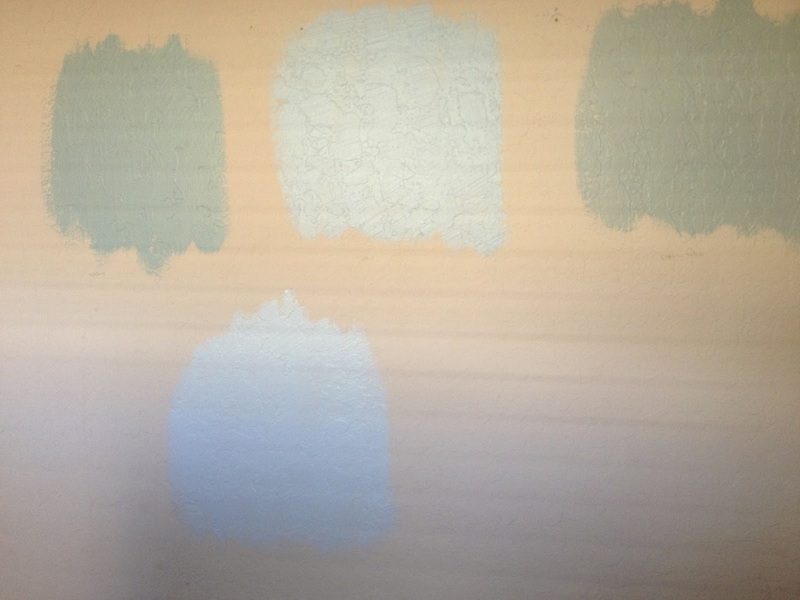 I thought of you when I was putting paint samples up. :) Good tip, Purdy! It was recommended to us that we do semi-gloss in the bathroom and matte finish on the common spaces. The matte in the family room has been bumming me out ever since I finished painting the thing three years ago. If you walk by it wrong, or rub up against it, or heaven forbid scratch or nick, there's going to be a mark that won't come off; attempting to remove it causes it to have an uglier mark. Touching up doesn't seem to take either. How does one deal with this problem? You seem to be doing a lot of paint research, and I'd love to know because we are repainting down there since we had a pipe leak/flood. Is flat the same as matte? I know nothing about it and I bet there's some way of dealing with this issue. I do believe flat is the same as matte. I'm hearing lots of parents have issues keeping matte walls clean and unfortunately I got nothin' for ya. Although have you tried those Mr. Clean Magic Erasers or whatever they're called? Those work on just about anything. I guess with matte walls you just have to commit to painting every five years or so. I know most of our walls hadn't been painted in god knows how long and looked fricking terrible.